Coming to you this month is a pawsome pet product that I loved receiving for review. Now, if you've been following me for a minute you know that my dogs are senior pups, are missing some teeth and have been at risk for pancreatitis. I always like to monitor their food and check for the protein and fat content. Not only does this pour over smell and taste great (per the dogs) it is low calorie and healthy! Per serving it has 64 calories and is made up of Chicken Bone Broth, Chicken, Pumpkin, Apples, Butternut Squash, Tapioca, Potato, Cinnamon, Ginger. Each of these ingredients provides a beneficial boost for your pup. chicken bone broth - protects the joints, is good for the belly and digestion, and keeps a coat and nails shiny and strong. apples - rich in antioxidants, dietary fiber and vitamins A & C.
butternut squash - rich in vitamin A & C, fiber, and potassium. These vitamins and minerals support the health of your dog's vision, immune system, colon, muscles, and more. 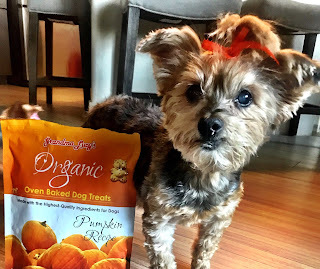 Butternut squash also helps your dog's digestion system. potato - contain vitamin A, C & B6, calcium, potassium, magnesium, and iron. ginger - Ginger is high in antioxidants, making it great in the fight against heart disease and arthritis as it is a natural anti-inflammatory. A dog suffering from inflamed joints could gain some relief from taking ginger. Bebe and Jolie really enjoyed this pour over in their food and I was quite the happy fur mom knowing that it was jam-packed with yummy goodies for my senior pups. I especially like that this product is human grade and contains no corn, no wheat, no soy, is GMO-Free, Grain-Free, and Gluten free. 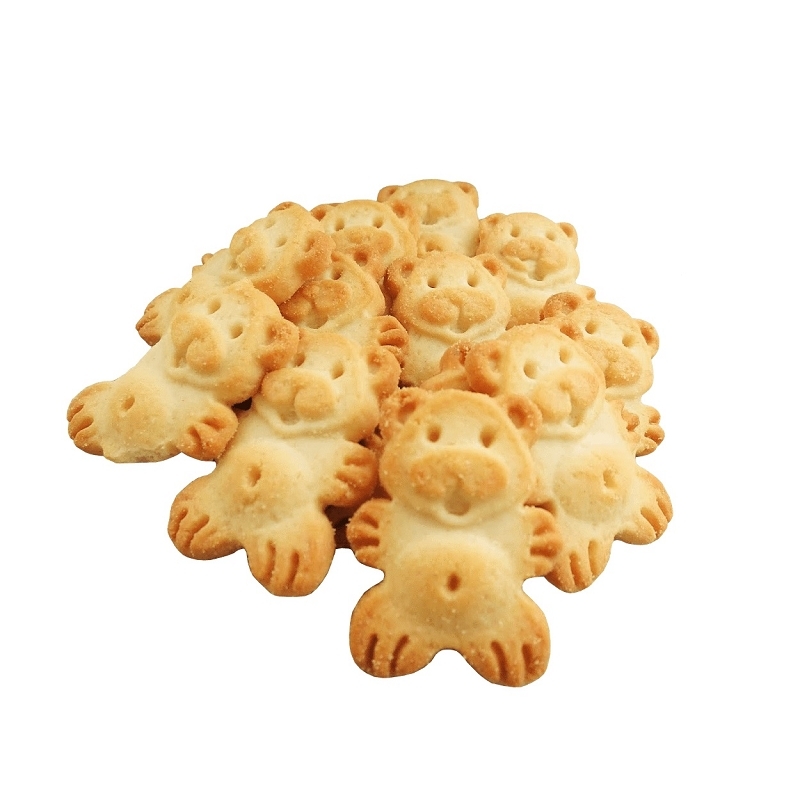 You can head on over to Chewy.com where they have a ton of flavors! As you can see from the photos below, this was a hit with my pups. This also makes for a perfect on the go snack when traveling with your pup. If you have toothless senior dogs that are #hairnotsoscary, you can wipe their little whiskers and mustaches after eating this with a baby wipe. 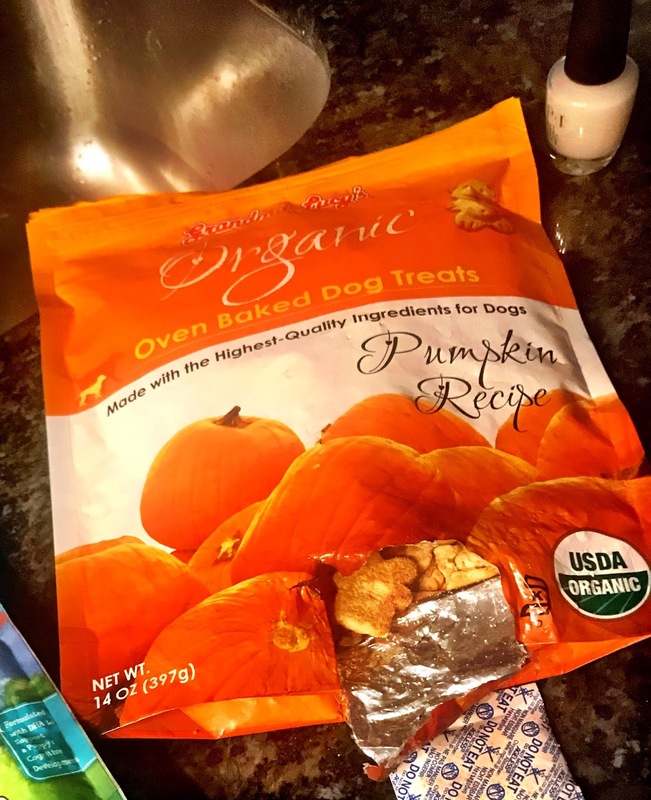 Or don't wipe at all and let your fur kiddos kiss you with some human grade pumpkin deliciousness! It might be tempting to let your puppy sleep in your bed, especially if the idea of training him or her to sleep in a dog bed feels like an infinite test of your patience and heart. Those big eyes and that little whimper just don’t feel worth the heartache of sleeping separately at night. The process can be especially tough if your puppy is newly adopted and still trying to get used to their home. The good news is that you’ll probably find training your puppy to abandon your bed for their own isn’t nearly as tough as you thought it would be. As long as you’re patient, compassionate, and willing to praise and reward good the desired behavior. Don’t expect your puppy to immediately make the leap from your cozy adjustable bed to their much smaller dog bed overnight. Patience is key, as is a slow but routine approach to getting the puppy used to laying on their dog bed. Start by getting them to lay on the bed for a few minutes at a time. 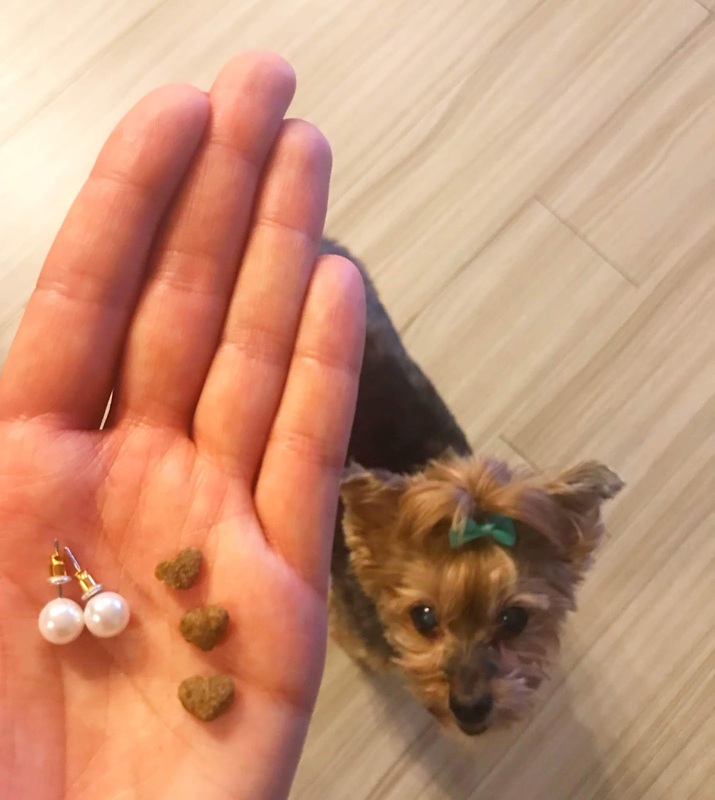 If he or she cooperates, reward your puppy with a small treat. Repeat this step a few times, adjusting the amount of time the puppy is expected to remain on the bed. Allow the animal to work its way up to getting used to spending hours at a time on the bed. Eventually, they’ll be used to their new bed and have positive associations with it. If your puppy is newly adopted, it might be best to take this approach from the beginning so you don’t have to re-train them to a dog bed after getting them used to sleeping with you. Not every dog bed is the right fit for every puppy. A smaller dog bed is great if your puppy is a smaller breed of dog. However, a puppy you expect to grow very quickly in a matter of weeks could soon outgrow the dog bed before even getting used to it! Aside from fit, the shape is also a crucial factor. Puppies that curl up are likely to appreciate a rounder, oval-shaped bed. A square mattress works better with puppies that like to stretch out. The more comfortable the dog bed, the easier your puppy will adjust to it -- and faster! It might feel tiring to try to get your puppy used to their new sleeping space, but don’t give up. Some puppies, particularly those with a lot of energy, can take longer to warm up to a bedtime routine than others. Take a calm assertive approach to bedtime while continuously rewarding cooperative behavior. If you’ve taken every step to provide them with a safe, comfortable sleeping space, then your puppy should warm up to the dog bed in time. A special thanks to our guest blogger, Amy Highland. Amy is a sleep expert at SleepHelp.org. Her preferred research topics are health and wellness, so Amy's a regular reader of Scientific American and Nature. She loves taking naps during thunderstorms and cuddling up with a blanket, book, and cats. 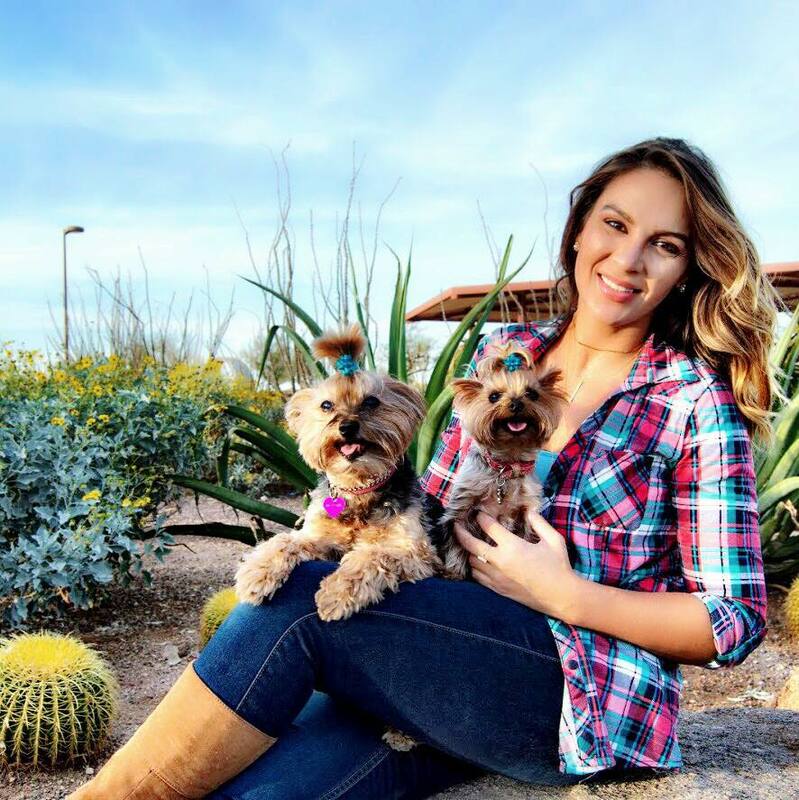 Just like a regular fitness account showing off the results, but little of the struggle to get there, most dog-inspired Insta accounts are all about the gooey, cutesy, they-are-so-precious moments every dog owner experiences – every once in a while. No one ever shows the potty training accidents on the pillow or the barfing incident on the laptop. Most people who have never had a pooch in their life think – I should get a dog, look at them, they are amazing! And they are, rest assured, but they also come with a slew of responsibilities that make the dog parenting role all the more challenging. Whether you’re a newbie in the pet parenting world, or you’re simply craving for a few clever tips to simplify your already complex existence, read on for a few handy hacks that might just do the trick. Even the most obedient of breeds such as German Shepherds can make a mess when left alone for the first time, or while they’re still in the home-training stages. However, if it’s Sunday evening, you’ve picked up a stray pupster and you have no clue what to do, there are a few ingredients in your kitchen cabinet that will come in handy throughout your most difficult training period. Mix equal amounts of water and apple cider vinegar into a spray bottle, and add some baking soda in the mix. You’ll have an incredibly simple cleanser that’s not harmful to your dog or you, and that quickly removes any dirt and odor from your carpets, floors, and furniture. For those who allow their pets on the furniture (hooray for you! ), consider getting a few extra sheets, pet-friendly furniture covers, think blankets, and pillow cases to cover the spots your pooch likes to visit. They are easy to wash regularly, durable for those who like to play-bite, and they are skin-friendly even for allergy-prone dogs if you go with cotton or fleece. Kibble is designed to provide your growing pup with all the macro and micronutrients they need, so it’s natural that most dog owners prefer the store-bought to cooked meals. However, choosing quality dog food does matter, since additive-free, all-natural types are far more likely to prevent food allergies and keep your dog’s digestive system happy. It’s a preventative measure that will help your pooch stay a strong little rascal, one that will not get sick easily. Some puppers smell worse than others, and whether your dog spends plenty of time outside only to stink up your own place or their natural scent bothers other family members, you can make your own doggo-friendly deodorizer. Another great solution for keeping the air in your rooms fresh and odor-free is getting an effective HEPA air purifier that removes pet dander successfully. While we’re on the subject of essential oils, lavender is a known calming ingredient that you can use to help your pooch cope with anxiety or any kind. Put a few droplets on a bandana, tie it loosely around their neck, and see if it works – some dogs may need extra training and patience, while others will respond exceptionally well to the scent. Some dogs are picky eaters, while others will munch on anything they get their paws on – but you can make their summer days easier with frozen treats. For example, most dogs love peanut butter, and even if they don’t, they’ll definitely go for some chicken broth. Just pour some into your ice-cube trays and you’ll have a supply of frozen treats for a few days. This is especially handy for owners who are helping their furry friend get rid of separation anxiety. They will be much more likely to calm down if they have access to something that carries your own scent, such as an old sweatshirt. So, why not make the most of it by turning it into a homemade bed? All you need is a pillow (or a few, for larger breeds), some extra fabric, and a sewing kit. If your dog is indeed a Great Dane, you may need several hoodies instead of a single! A little can go a long way when it comes to keeping your dog’s paws safe for those cold winter walks as well as hot summer pavement. Using a dab of Vaseline to massage into your pooch’s paws will help them prevent chafing and irritation, so always keep some in your doggy supply bag. Another must-have for pet parents is hydrogen peroxide, a solution you can purchase in any pharmacy, which will help you induce vomiting if your dog eats something they were not supposed to – hopefully you will not have to use it, but this is one of the very few ways to prevent poisoning if you catch them in the act right away. We hope you enjoyed this content. This blog post was brought to you by our pawsome guest blogger Zara Lewis. Please head on over to check her awesome content out! Woof bark fam! Last month we received a product to review that Bebe and Jolie did not enjoy. 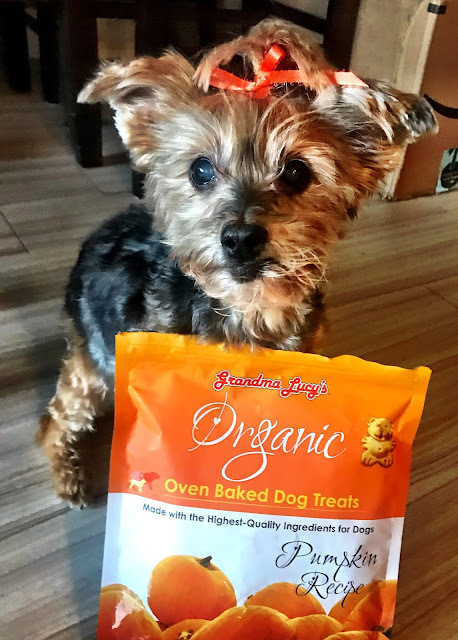 They are notoriously fussy Yorkies and very selective when it comes to kibble. We've tried Zignature brands before but when given the chance to try Kangaroo, we hopped right to it. Well, they weren't a fan. My coworker Daniel has a dog named Layla, she is 5 years old and also notoriously picky when it comes to kibble. I offered Daniel the food as I hate to waste food, dog and human alike. Well as you can see from the pictures it was a win! Layla is a 50% German Shepherd, 50% Siberian husky, with sprinkles of sloth in between. She lives in sunny Arizona and is also "the laziest & prettiest dog in the world" according to her furdaddy! 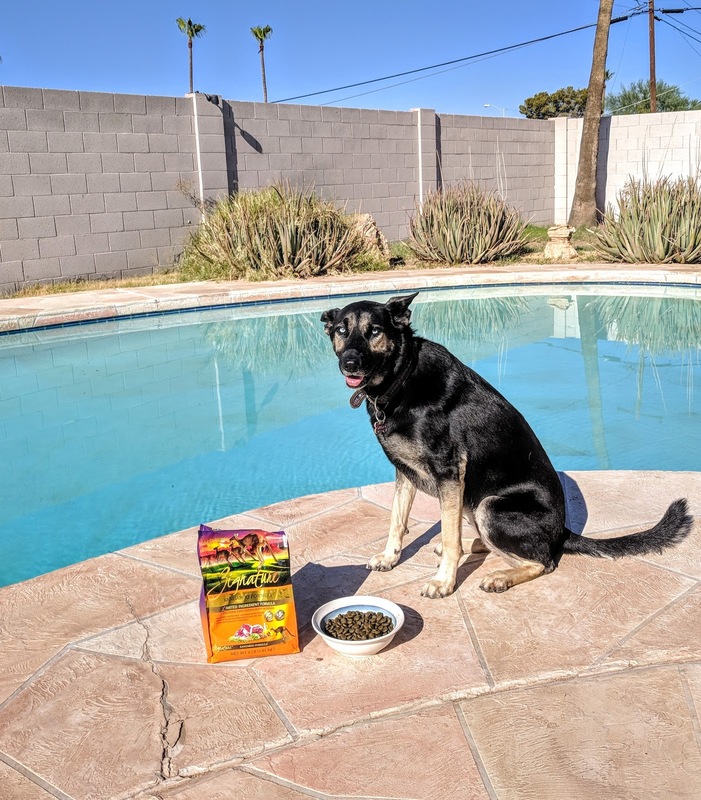 This kibble is grain free and made from real, Kangaroo from Australia, wholesome peas, chickpeas, and flaxseed. 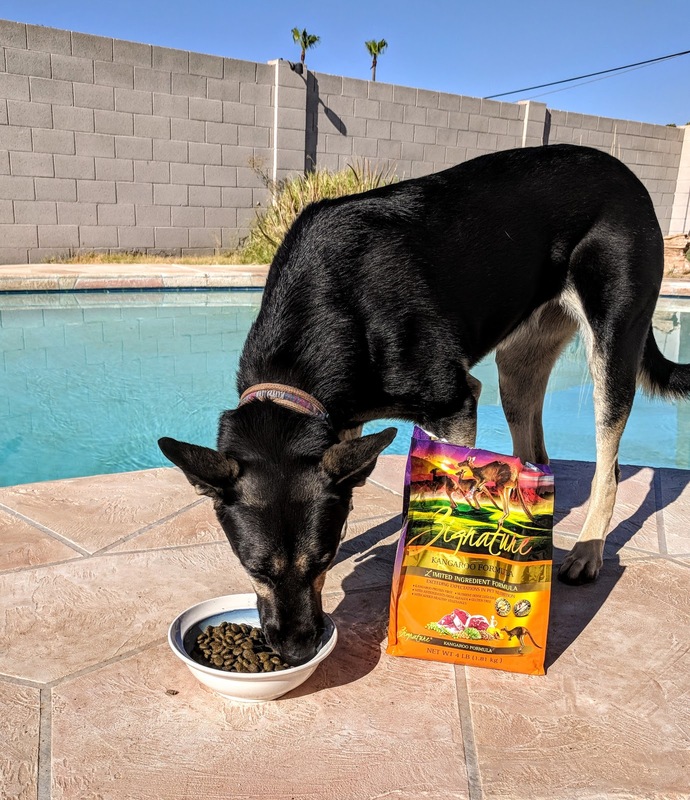 This meat-first recipe offers pups the protein they need to thrive, while Zignature’s limited ingredient recipe throws out troublesome ingredients like chicken, corn, wheat, soy, and potatoes, creating peak hypoallergenic, low-glycemic nutrition. Combine that with key antioxidants, essential fatty acids, and a complete spectrum of vitamins and minerals for a well-rounded meal that goes beyond nature to become your pet’s signature food for life. Did you know that Kangaroo contains nearly twice the Vitamin B12 as other meats and is rich in Iron, essential Omega-3 Fatty Acids, other B Vitamins, and Conjugated Linoleic Acid (CLA)? Most pups have some sort of allergies. 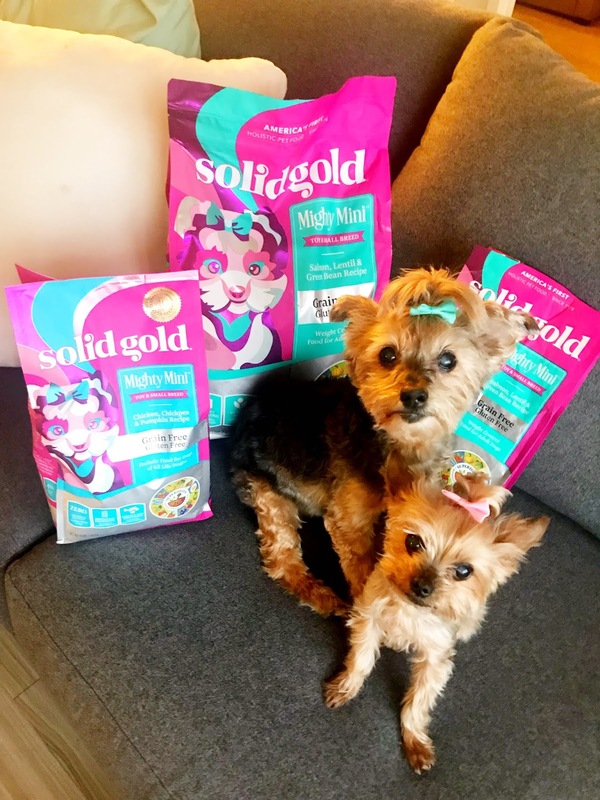 Bebe and Jolie love the Zignature brand because they are allergic to corn. 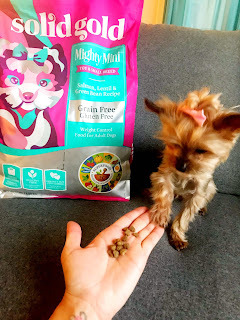 This dry dog food is free of the most common potential canine allergens: corn, wheat, soy, dairy, and chicken, making this recipe ideal for pups with sensitivities and picky eaters. You don't have to compromise for nutrition either as Zignature food contains wholesome fruits and vegetables round out the recipe with powerful antioxidants, and fiber-rich, low-glycemic carbohydrates. Go ahead and give the many different flavors a try! Disclaimer: I received these goodies free of charge from Chewy.com in an exchange for my honest review, and here you have it! As a fur mom of two senior Yorkies, it is no surprise that this breed comes with joint problems later on in their lives. 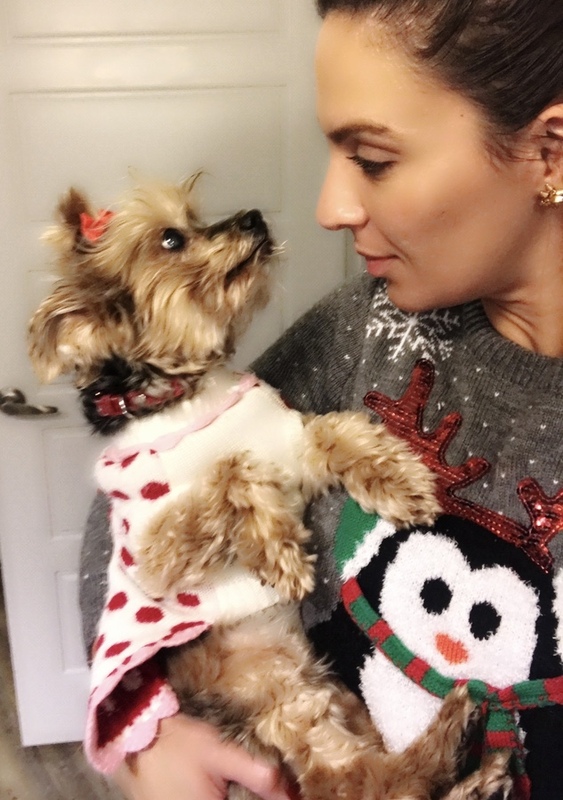 Yorkies are part of the terrier family, and are extremely active. My oldest dog is 15 years old and still flings herself from the bar stool onto the couch. I nickname her my giddy gazelle. Both of my dogs have fluxating patellas which is pretty common in this breed and to prevent arthritis and swelling I have been supplementing them with glucosamine for the past few years and it's worked really well. Glucosamine is more commonly known as Cosequin® and its main use it to help promote mobility and joint function in dogs and cats. Arthritis refers to inflammation or swelling in a joint and what these supplements do is help provide the necessary nutrients for cartilage repair and function. These treats were a win in the Prisky Paws household. 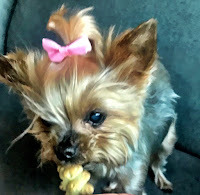 I gave my 10lb Yorkie one full chew and my 5lb Yorkie 1/2 of one chew as per the weigh recommendations on the back of the packaging. As an added bonus these chews are contain omega-3’s for a healthy skin and coat. The chew is soft and chewy, perfect for my two little girls who are missing most of their teeth! Disclaimer: I received these goodies free of charge from Chewy.com in an exchange for my honest review, and here you have it! I've been feeding my dogs glucosamine for years and so I was super happy to try this product due to the added benefits in the treat of the omega 3's!